The bolon, or bolon bata, is a slightly strange looking and rarely seen member of the harp family of traditional West African instruments. I had no idea what it was the first time I saw one. This is a common reaction with people often mistaking a bolon for a kora. It’s difficult to get much reliable information about this instrument. I only know younger players who’ve taken it up, but no older players who’ve had the knowledge passed on to them through their families, so my understanding of it is fragmented and incomplete. Never-the-less it’s an utterly fascinating instrument with an amazing sound and a long, long history. With its magical and mystical qualities, maybe it is only right that this remains at least partially obscured. Bolons are a chordophone instrument, making sound by way of a vibrating string or strings stretched between two points, like harps or lutes. They are the ancestors of the better known African harp the kora and the lute like Ngoni. The bolon is one of the oldest of the West African stringed instruments and was originally associated with the hunting and warrior traditions. It’s been present in West African society since before the Mandinka empire even began. Like the kora it was also played in a ‘bard like’ way at the courts of the kings to tell of their exploits or to praise their might. Unlike the kora, however, it isn’t associated with the griot, or jeli (or jali depending on source) tradition of hereditary musicians. The bolon may well have been played by the jon (slave) group in the past so is an instrument of the people rather than just an instrument of the court. It was played to give courage to hunters, warriors in battle, at ceremonial processions, funerals of warriors or great hunters and to encourage workers in the field. So it had a huge variety of ceremonial and social uses. It also seems to have served as an instrument of communication in that victory or defeat in war could be announced in a village by the bolonfola (skilled bolon player). It is played by a number of tribal groups – Mandinka, Susu, Banbara, Fulbe, Senufo and Kissi, in Guinea, Mali, the Ivory Coast, Burkina Faso and Sierra Leone so is not associated with just one tribe or country. 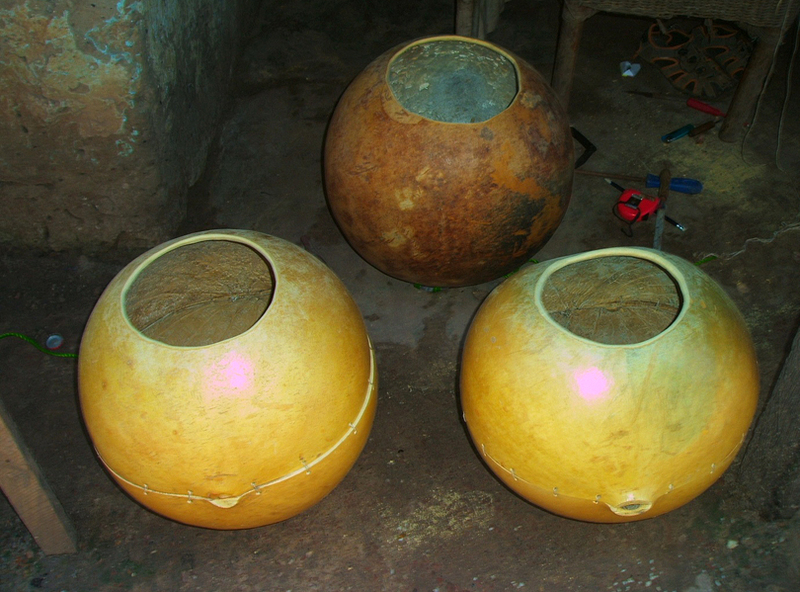 Bolons are made from the ubiquitous gourd (or calabash) which is part of so many West African musical instruments and which can be found in a variety of forms. It can be made from a complete large gourd, or two smaller cut ones which are then sewn or glued together. This part, the resonating chamber of the bolon, is then covered with goat skin (sometimes this can be cow skin, I’ve heard, but I’ve only seen bolons with goat skin coverings) and a curved wooden neck is added. It is said the shape of the neck is a reflection of the hunters bow and adds to the bolons’ magical qualities. 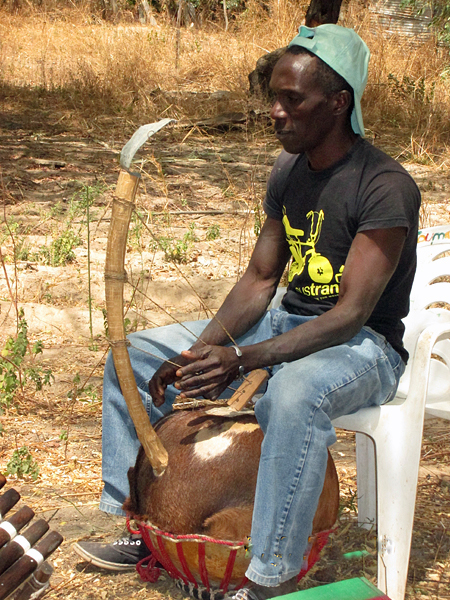 The strings – either 3 or 4 – are made of twisted raw hide (generally from a piece of goatskin left over from skinning a djembé drum) and are attached to the neck and a bridge on the top of the gourd body. A metal resonator is then added to the neck, generally similar to the kseng kseng sometimes added to djembes. Any old piece of metal can be used for this or a very beautifully crafted item – whatever is available. This adds another layer of sound, like kseng kseng on a djembé and can be struck with the hand for extra effect. Strings are tuned by moving the rings up and down the neck. Some modern musicians have added a 5th string. Like the modern kora, you can now make or buy bolons with machine head tuning to make the process easier. I have several times watched my friends making or mending bolons with fascination and managed to make a video of one of them. Making a bolon from scratch over a week or so, a couple of years ago, which you can see on YouTube. The tonal character of a bolon is similar to that of a double bass; it has a very powerful warm resonance. Each instrument has a totally unique voice; no two bolons ever sound the same. It’s generally played by holding it between the legs, with the curve of the neck facing the player. I’ve occasionally seen them being played by a standing musician, the bolon secured by a strap of some kind. The strings are plucked with the thumbs while the knuckles or fingers rap on the gourd to produce counter percussion, a rhythmic counterpoint to the melody being played on the strings. This seems to be a very specific way of playing, different from that of the kora or ngoni, although kora players occasionally rap on the calabash they do it infrequently. Bolon players generally produce two separate rhythms, strings and percussion, which fuse in the glorious polyrhythm so characteristic of West African music. Sometimes the calabash body is played like a drum and is the ‘lead’ part, sometimes it’s the melody on the strings with the percussion as secondary. I’ve also heard that bolons can be played using a stick or metal rings on the hand that isn’t plucking the strings but I’ve never actually seen any played like that. It may well be an older style of playing or it may simply not be popular in the parts of Guinea I’ve visited. 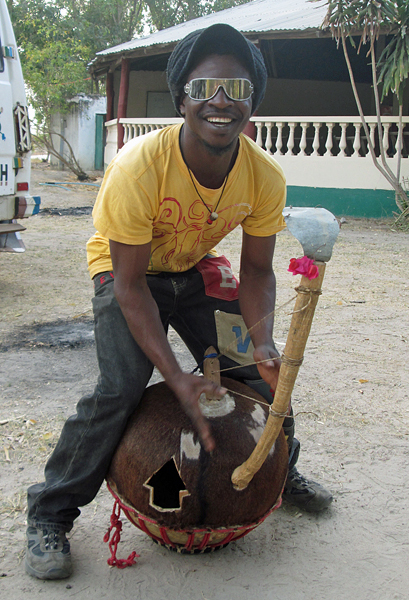 ‘Okameo’ Bangoura of Toumaranke Percussion, practising bolon in Sanyang, The Gambia. The resonator on the top of this one is made from a flattened tin can. The older way of playing, based on the hunting tradition, where the bolon is played to encourage the hunter or warrior, or sing of his exploits, has largely transformed into a different tradition of playing in ensembles. So a kind of ‘troubadour’ style with the bolonfola embedded in the social context has turned into a more performance based way of playing. This mirrors what has happened to the djembé and other traditional instruments also, a move from the village to the stage. In Guinea the ‘ballet tradition’ of musical performance for an audience (begun in the 50’s with the national troupes there) often includes the bolon. 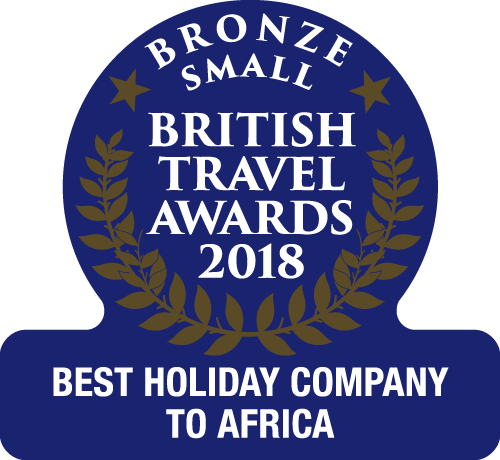 This continues both there and in contemporary companies like the Cardiff based Ballet Nimba. 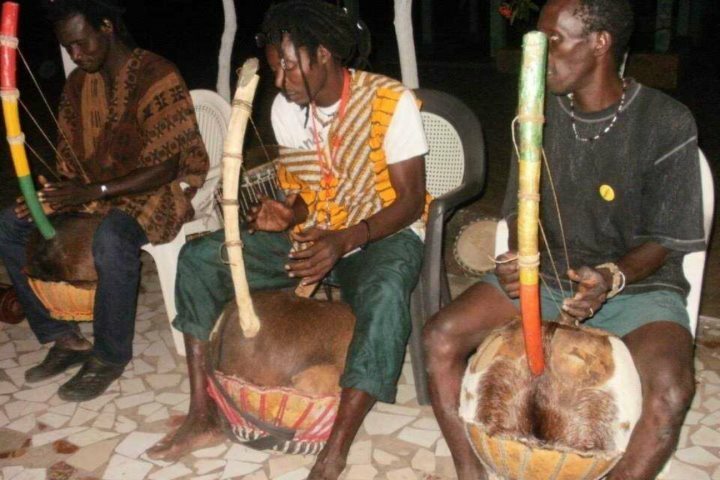 Modern musicians in Guinea like Etoiles de Boulabinet and Espoirs de Corinthe use bolons, in addition to other traditional instruments like balafons and koras, and sometimes more modern ones like keyboards and guitars. So the bolon, ancient and mysterious, has very much moved with the times and its rich, deep tones continue to enchant. Daouda Keita from Toumaranke Percussion, the hole in the calabash can be any shape and our bolon maker likes to ring the changes. Mande Music: Traditional and Modern Music of the Maninka and Mandinka of Western Africa (Chicago Studies in Ethnomusicology) by Eric Charry. Most definitive ethnomusicology volume on West African musical traditions. In this country there are musicians such as Guinean born Iya Sako who play and teach bolon. For more information visit IyaSako.co.uk . Also members of the dance/theatre group Ballet Nimba led by Idrissa Camara. They use some bolon mixed with other instruments, a good example of the modern ensemble tradition, on their excellent CD Sogay - Sunrise. For ore information visit BalletNimba.org.uk. Follow Ballet Nimbe on Twitter @balletnimba. Djembefolas such as Mamady Keita and Nansady Keita sometimes play bolon and links to them can be found on YouTube. Some other famous bolon players (again in a modern context rather than the older troubadour-like style) are Abdoou Diallo, Djigui Traore and Sadioko Diarra. Chris Sylla has been studying and teaching West African music since she made her first trip to The Gambia in December 2000. Based in Brighton, when in England, and Sanyang, when in The Gambia, she has extensive experience running percussion workshops in schools and with community groups, clubs, corporations, festivals and camps (both one-to-one and with large groups). She runs monthly balafon workshops and workshops with djembe folas (master djembe players) such as Nansady Keita and Sidiki Dembele both in the UK and The Gambia. She is married to Moussa Sylla, a Guinean musician, and together they run workshops in The Gambia: The Toumaranke Experience. She also performs with Toumaranke Percussion who's debut album Takhaudi Deqau: Inside the Chicken's Mouth can be bought in either digital download or hardcopy.